We are not just a mobile programming company. We stay with you throughout your App Lifecycle. We employ Business Specialists to study the potential in your idea, to develop a wholistic view of your app, and a comprehensive business and marketing strategy. An app's UI/UX is responsible for translating a great app idea into a success. We prioritize user-friendly flow of the app which could determine its user acceptance. There is nothing better than a stunning splash screen followed by elegantly crafted graphic elements. We understand what appeals to the modern users. We are a team of over 300 Software Engineers. We are well equipped to develop native mobile apps, cross platform apps, cloud apps and APIs in PHP and ROR. All our apps pass through various use-case scenarios and thorough stress-testing by our Quality Assurance Experts before coming into the hands of your users. Even a great app is outdated in less than a year without timely updates. Appdev360 can help you maintain latest technological standards throughout the lifecycle of your app. We discuss the feasibility of your app and the practicality of its execution in our 360 degree review. After discussion and changes in wireframes, we move ahead to actual screen designs. Here we take care of platform standards. App and Server programmers start their job and code the designs into actual working mobile app. Once the app is passed through Quality Testers and approved by you, we submit it to the marketplace and take care of any objections made. This is an optional step. You can retain Appdev360 after the launch of your app to provide maintenance and support services, and execute periodical updates on demand. 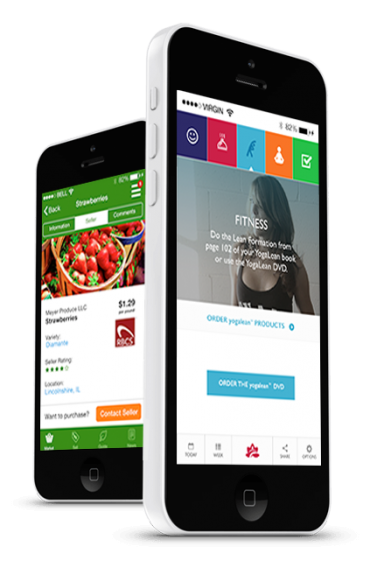 The Packer’s Produce Universe is the virtual marketplace for the fresh produce supplier. It is a place where buyers, sellers and service providers connect in real time, exchanging trade information. App for doctors to communicate with their patients. They can approve appointments scheduled by patients, queue patients in waiting area, assign rooms and review patient history using text and charts. LET US FINISH YOUR HALF-COOKED IDEAS. If you have drawn similar looking mind map on your notebook, you have already done your part of the job.